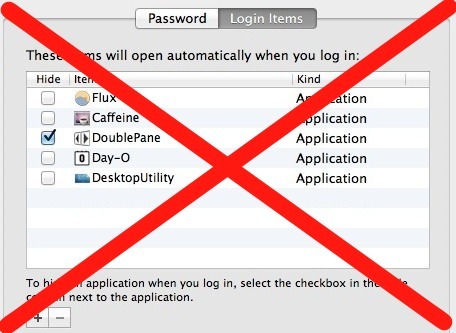 Login Items are applications and helpers that launch immediately when a user logs in to Mac OS X. These apps and utilities are easily adjusted and managed in system preferences on a user level, but you can also temporarily disable them on a per-boot and per-login basis if need be. To stop the automatic login items in OS X on a temporary per-boot basis, you need to use a keystroke modifier at just the right time. This is slightly different depending on the status of password protection on the Mac, but the basic idea is the same. To temporarily disable all login items and login apps from loading upon start or login of OS X, hold down the Shift key when clicking the “login” button and continue holding the Shift until the desktop displays on the Mac. This is how it works on a password protected Mac. Generally speaking, all Macs should use a password for login. If for whatever reason the Mac does not have a password protection set on boot or login, you can still disable the login items, but the timing is slightly different. For Macs without a password set, you can hold the shift key after the initial grey Apple logo boot screen has passed. If you start holding Shift too early though, you will end up in Safe Mode* instead. Disabling Login Items were recently discussed as a means of speeding up boot time of OS X, which can be very effective. Using this temporary method will let you see the speed difference directly, before they’re disabled completely. It’s also a very handy troubleshooting trick, which can help to determine if an application is proving problematic on a Mac, a common symptom of which is a very sluggish login, a beachball cursor on login of OS X, or a crash dialog immediately after the Mac login. Thanks to Dan for leaving this great tip in our comments. * On a side note, booting a Mac into Safe Mode also will turn off the login items for that particular system boot.